When the Palm Canyon Theatre (PCT) of Palm Springs, CA opened its doors twenty years ago it made a promise to the community to bring professional-quality, theatrical entertainment to the Coachella Valley. Thanks to the efforts, dedication and vision of the Layne family of theatre professionals – the family rich in producers, actors, directors, designers, and choreographers, – has not broken that promise. I’ve been reviewing their productions for the same twenty years beginning with the opening musical production “The Desert Song”, to their current musical “In the Heights” that recently opened to standing ovations. Mind you, there have bumps along the rocky road of producing top theatre entertainment over the years, however, their quality track record is long in Desert Theatre League (DTL) award-winning and praise-worthy productions. Who can forget such wonderful past musicals as: “Man of La Mancha”, “Dr. Jekyll and Mr. Hyde”, “Cats”, “My Fair Lady”, “Jesus Christ Superstar”, “Les Miserable” “A Chorus Line” and many, more. My apologies if I left off one of your favorites. But these come quickly to mind, and I didn’t even mention the dramas and comedies. 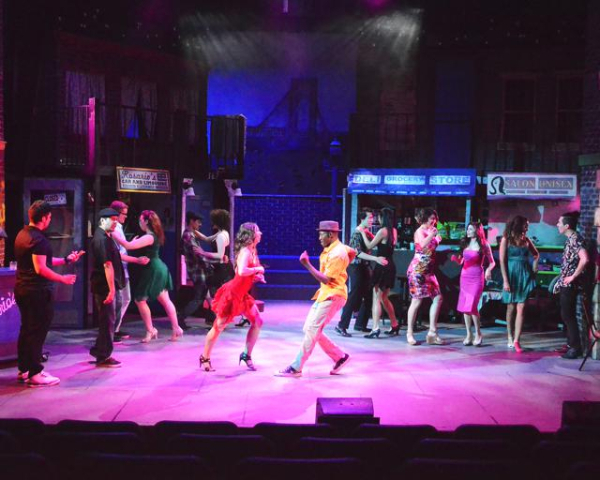 PCT can now add “In the Heights” to its roll call of fabulous musical productions. With music and lyrics, by double Tony-award winning playwright, actor and director Lin Manuel Miranda (he of “Hamilton” fame) along with a poignant libretto by Quiara Alegria Hudes, this high energy musical, terrifically and seamlessly directed by Shafik Wahhab, is a true ensemble effort both on stage (there are twenty performers) and backstage, with another three-stage crew and production ‘techies’ that help make the onstage magic happen. One can only imagine the traffic- management issues taking place backstage that make the onstage action look so smooth and effortless. The Scenic Design by Shafik Wahhab and Ross Hawkins and the Lighting Design by resident theatre design wizard J.W. Layne, and sound design by Lyla Cordova, make sure their talented singers and dancers have the space and lights to perform the high-octane dance routines created by Jacqueline Le Blanc. It’s one of PCT’s best dynamic and germane technical efforts. And it’s a crowd-pleaser. The musical score that features 23 musical numbers in the capable hands of musical director Scott Smith is both infectious and compelling with sizzling Latin rhythms like Salsa and Merrengue performed in costumes either selected by or created by designer Derik Shopinski and his assistants: Virginia Sulick and Delinda Angelo. There will no doubt be audience members who feel they have seen the ‘story’ before. Echoes of “West Side Story”, and “Romeo and Juliet” story points do jump out. But, hey, that’s pretty heady company to be in. If you’re a classic play or a modern America musical about immigrant population issues and the role they play in our 21st century society and audiences, then you will love what the creative team does with “In the Heights”. The story in short, explores three blistering hot summer days in an area or neighborhood in NYC known as Washington Heights, on the upper west side, overlooking the Hudson River and the George Washington Bridge. It’s a neighborhood that has been going through changes and is now a neighborhood of mostly Latino residents. Heading a cast of twenty characters is first generation Dominican-American entrepreneur Usnavi, the owner of the local bodega. He is thinking about returning to the Dominican Republic to reconnect with his family and friends following the death of his parents. Usnavi, is winningly played and sung by Matt Sambrano. Support of ‘family’ and family related emotional issues have always been extremely important to the Latino community. “In the Heights”, also chronicles the daily struggles of the neighborhood in its day to day existence of raising families, paying the rent and trying keep one’s business from going bankrupt, along with the age-old frustration of the younger residents in not being able to make their own choices in their searches for love, romance, and marriage. With a cast, as large as this one, it’s always a challenge to list everyone due to space limitations, however there are always standout performances. Heading a cast of twenty performers, including Sambrano’s lead character of Usnavi, is lovely Meagan Van Dyke as Nina, a university student, in love with Benny (Joey Wahhab) an employee in her father’s business. Van Dyke, the possessor of a sweet soprano voice is very compelling as a conflicted young woman in love and at odds with her parent’s decisions when it comes to her future. Nina’s father and mother are solidly played and sung by Benjamin Perez and Adina Lawson, respectfully. Allegra Angelo, as Vanessa, the love interest of Usnavi, once again turns in another stellar dance and acting turn. 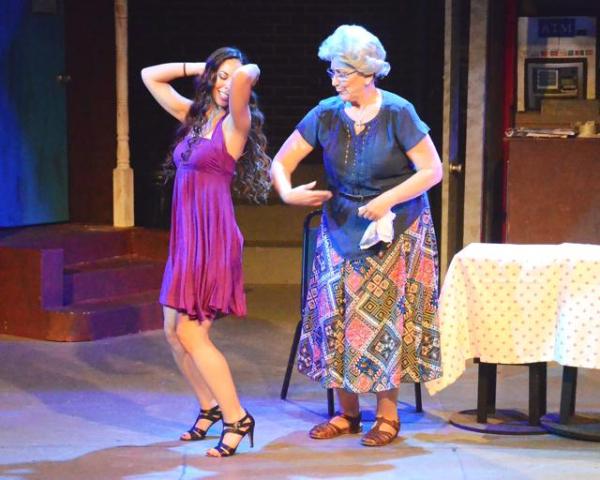 Her Mimi performance in the College of the Desert production of “Rent” two seasons ago still resonates. 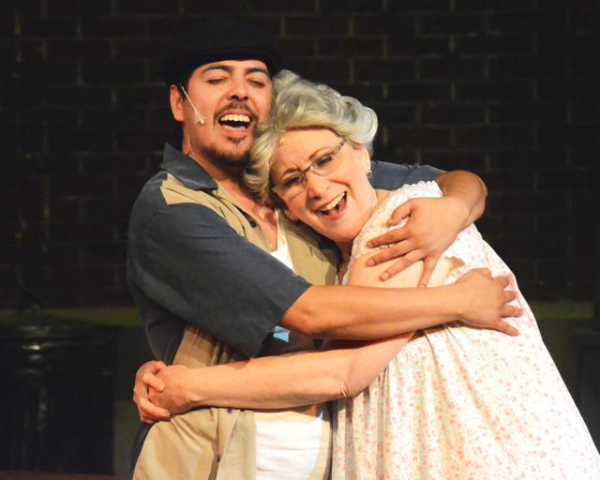 Suzie Wourms, multiple Desert Theatre League award winner, also scores in a little gem of a performance as Abruela Claudia, in her numbers with Sambrano and the company. The principal dancers in this outstanding production are technically and visually stunning in their execution and deserve a mention of their own; despite space restrictions. The men are: Vertarias Black, who floats in the air in his numbers, Ian Tang, Mat Tucker, Adrian Fernando Vera, Daniel Zepeda, Scott Clinkscales, and Jacob Samples as Piragua Guy and dancer, deliver the testosterone at all the right moments. The ladies: Marella Sabio as Graffiti Street, in her explosive and high energy routines is mesmerizing. Haley Izurieta, Megan Ramirez, Ileana Mendoza, Kate Antonov, and Maglia Sabio provide the sizzling sensuality required in their performances. 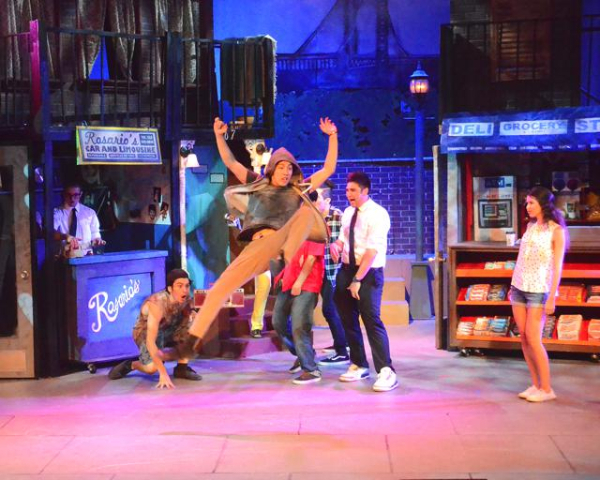 The beauty of “In the Heights” lies in the ensemble performances of the entire company where everyone is unselfish; fully engaged; in the moment; committed and dedicated. When performing companies get into this ‘zone’, as they say, it’s a joy to behold and the audience knows it and feels it, as well. This splendid production performs at the Palm Canyon Theatre, in Palm Springs through July 16, 2017. For reservations and ticket information call the box office at 760-323-5123. Reposted courtesy of Desert Local News.